Brisco’s 84th minute goal was too little too late for the Jeffs. The season ended earlier than anyone expected. The women’s soccer team, seeded number one in the New England region, was upset in the first round by unseeded Lasell College. Having earned the right to host at least the first four rounds, the Jeffs fell 3-1 to the Lasers. Molly Masiero ’16 struck in the 22nd minute. Perhaps more importantly, center back Sandy Shepherd ’13 was injured on the play and would not return to the game. The College’s other center back, Emily Little ’13, was suspended for her now-infamous throw-in. Looking to compensate for the absence of both center backs, the Jeffs nearly equalized. Kathryn Nathan ’13 found Brisco in space, but her touch was parried by Lasell keeper Ashley Parrelli ’13. Nathan nearly scored herself in the 32nd, but Parrelli denied the effort once again. Nathan garnered another opportunity in the final seconds of the first half, but her shot caromed of the Laser wall and right post to send the Jeffs into halftime with a 1-0 deficit despite a 9-4 advantage in shots. Coming out of the half, the Lasers looked to be the aggressor. They extended their lead in the 52nd minute, when Bridget Lynch ’15 combined with Kayla Lynch ’15 to get the better of the Jeff defense and double the Lasalle lead. Following the goal, Amherst attacked with a vengeance, knowing their season could soon be over. In the 62nd minute, Amanda Brisco ’14 found Chloe McKenzie ’14 in space, but McKenzie’s effort flew just over the bar. Five minutes later, Jessy Hale ’16 headed Nathan’s corner for what looked to be a sure goal, but Parrelli made an acrobatic save to preserve her clean sheet. Just a minute later, Bridget Lynch caught the Jeffs’ defense pushed too far up the field and capitalized with her second goal of the game. The score gave the Lasers a 3-0 win and effectively ended the game. The Jeffs attacked in the final minutes of the game, but it was too little too late. Brisco’s goal in the 84th minute was more a consolation than anything else. The offensive fury gave the Jeffs a 21-10 shot advantage, but a combination of stellar goalkeeping by Parelli and poor finishing proved to be the Jeffs’ nemesis. 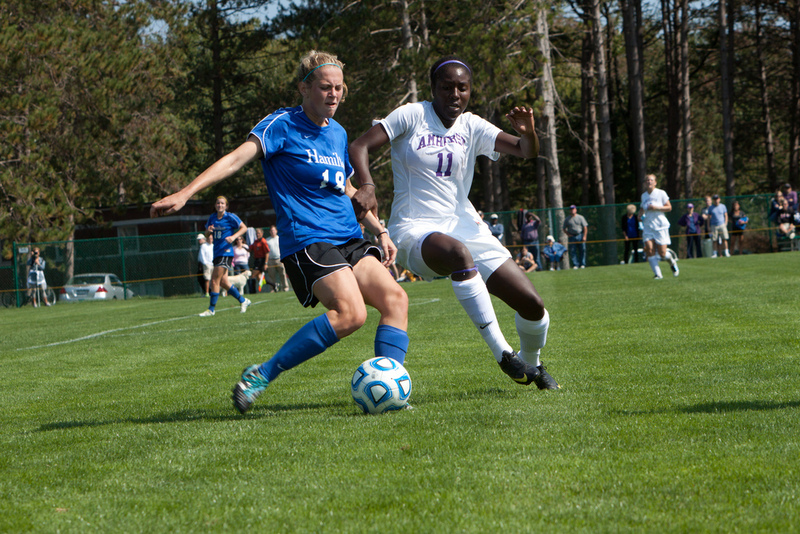 “In our final game against Lasell, we were unable to finish our scoring opportunities. Lasell capitalized on the chances they were given, and we were unable to catch their three goal lead,” Nathan said. The College finished the season with a 13-2-2 record, but will consider their playoff performance a disappointment. The senior class of Nathan, Shepherd, Little, Drew Douglas-Steele, and Bridget Keller compiled a record of 54-14-5 and will be sorely missed. There is hope for the future, however, and Nathan is optimistic that her team will meet the expectations they have set for themselves.